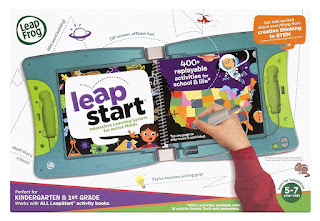 Welcome to TMG: LeapFrog Leap Start Interactive System Review! LeapFrog Leap Start Interactive System Review! 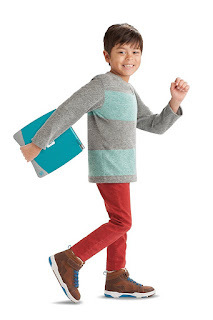 You guys may remember during the summer when I was invited to the Leap Frog showcase and that the Leapfrog Leap Start System was by far my favorite product of the new line. Well we got a chance to try it out and I am not surprised to say- it lived up to all my expectations! So how does this work? Easily. The system is based on three key components, the book holder, the books and the stylus. The book holder and stylus come in two styles-one that is built for the tinnier hands of pre-school-kindergarten students. This version has a chunkier appearance, and a wider stylus that helps your child learn how to grip a writing tool correctly, as well as folds up and is easier to carry for that age range. The older looking version has a sleeker almost laptop look to it and thinner stylus- that appeals to the older kids, however both work with all the books in the line- so you never have to replace the case itself unless you want to. The line of books has endless possibilities- but already has a library full of wonderful lessons. Touch the stylus to the key components of the books and it will respond by reading the words, playing music, telling jokes asking questions, etc. etc. . An example of a level one book-which is good for children aged 2 and up- would be “Scout and Friends Math”. This book has more than 40 repayable activates in the book, teaches 12 preschool and math problem solving skill like matching quantities to numbers, counting to 10 and more. This not only gives your child a wonderful introduction to the world of numbers but gives your child a fun and relatable way to learn. Go all the way up to the Level four books, which has a STEM and Problem Solving activity book. This has your child helping Professor Hamlin Hamster build a robot through the STEM learning system. Your child will go through the engineering design process of designing, building, and testing to build and improve this fictional robot. They will use blueprints, and graphs, to help choose and test out different power and strength sources and see what works best. I am telling you guys; it is really amazing to see how your child reacts to it. My son had such a great time trying to solve the problem that he did not even know that he was learning. That’s the best kind of education in my book- the sneaky kind. All the books in the line are great in their own way, each teach a different aspect of educational system, whether it be grasping the fundamentals of ABC’s or you know learning the basics of engineering, they all give your child a amazing tool to learn. Each book also has a great replay value because after they complete it the first time, it will level up the second time according to how well your child did during the first round. This gives your child a whole new experience the second time they play as compared to the first- different and more difficult questions will be asked, new ways to solve the same problem will be introduced, and your child will be entranced all over again- as mine was. how your child is doing in different learning categories, and my favorite part is- it has a headphone jack- which allows you to let your child learn, as well as having some quiet time of your own. This is a great system, that I am sure has a long and fantastic future ahead of it. 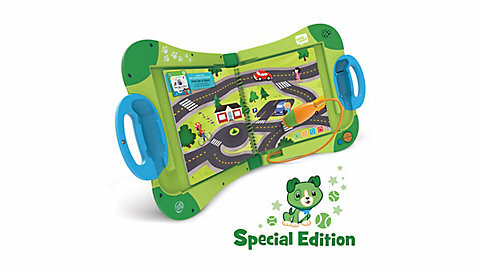 Helping our children learn and have fun is what Leap Frog does best, and they will not disappoint you when it comes to the Leapfrog Leap start Interactive Learning System.